Planning Commission Job Circular 2018 – The Planning Commission will appoint manpower for an attractive salary scale. Plancomm.gov.bd has exposed it. Actual Bangladeshi people can apply. Will you see all jobs related information, including the planning commission job circular? Keep visiting www.jobcircular.info to get a better result. To view the original job circular of the planning commission, please scroll down. So, you have to maintain work legally. Otherwise, you can visit the official website of planning commission that is www.plancomm.gov.bd. Nothing is possible without planning. Since the birth of Planning Commission, various development activities are being conducted. For these reasons, Bangladesh is developing day by day. The Planning Commission is conducting all development activities through various projects. Needs to plan any work. Skilled manpower needed to handle all development activities. Planning commission needs meritorious manpower. In the absence of proper planning, many development projects have not been benefited already. The planning commission is currently keeping a map of success throughout the country under the planning ministry. If the plan is not correct then no work can be done in the right way. So if you think you are eligible for a job in the Planning Commission, prepare yourself according to the notification. 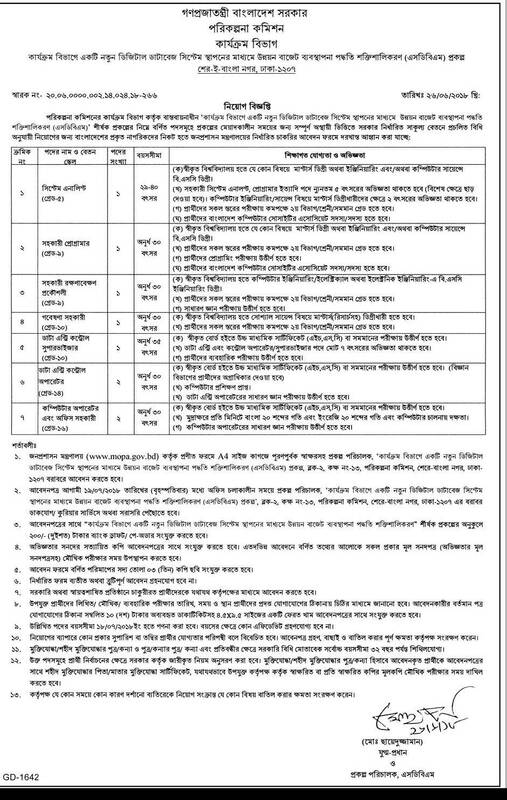 All job circular provided along with the following application process is given below. Post Title: System Analyst/Assistant Programmer/Assistant Engineer/Research Assistant/Data Entry Control Supervisor/Data Entry Control Operator/Computer Operator & Office Assistant. Education: See the job Notice. Jobs Description: It is a valuable job under the planning commission. Experience: View the job circular. Salary: Grade 05 – Grade 16. Apply Process : As per planning commission rules. Basically, the Planning Commission is working under the Ministry of Planning. In many cases, this institution is recruiting on a permanent basis. On the other hand, the manpower is recruiting on a temporary basis. Presently, Planning commission is one of the valuable department in Bangladesh. This organization recruits manpower in a limited range but also displays large-scale recruitment notice at different times. At any rate, All the rules of the job circular must be followed by every job applicant. All necessary papers should be presented. You Can not join the job with any wrong information. If false information is available later, then authorities can take legal action. The Planning Commission may amend the appointment notice without expressing any reason. However, The most important section of human life is employment. You need to exact preparation to participate in the jobs exam. Jobs cannot be found only if the certificate is available. You need proper preparation. In this case, proper preparation will continue from the beginning of education. At the end of your education, you will have much trouble getting ready for the job. It is one of the finest job circulars. Finally, be careful about this situation. Thanks for reading this information! We will update planning commission job circular 2018 regularly. Keep in touch!